Welcome to part 8 of our Snapchat Influencer Q&A series, where you can learn from the masters as we deconstruct the techniques used by Snapchat influencers. 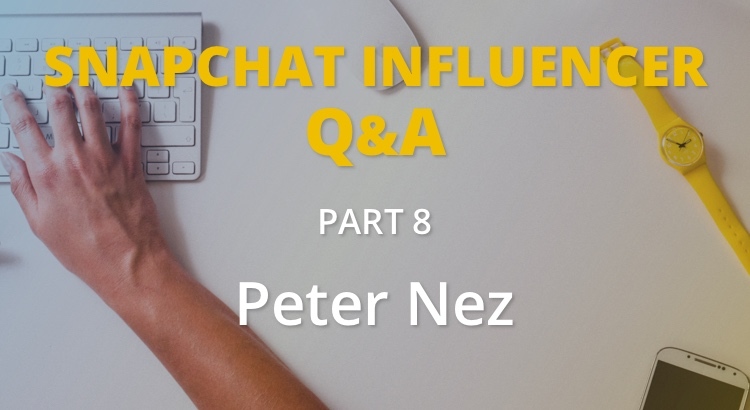 Today we are talking to Peter Nez. Peter is a Keynote Speaker, Content Creator and Live-Streamer. He is a Snapchat enthusiast and frequent poster in the Snapchat Marketing Mastermind group on Facebook. Peter also hosts a popular weekly Snapchat show called #nezonwheels where he gives advice to help others live a better and healthier life. Let’s get into the interview. Q: Hey Peter, great to meet you. Thanks for taking the time to share you knowledge with us. Could you tell us a bit about yourself and what you do? Peter: Hello Jason, I am an author, speaker, and writing professor who loves Snapchat because I recognize the shift that is happening in the world of 21st century narrative, which is visual storytelling, or you could say video storytelling merged with text and graphic design and the beautiful thing is you don’t have to be technically proficient, a video production expert, or a graphic artist to execute your story. The only requirement in my opinion is you have to be real. Authenticity engages your audience more than video quality or design. I love that about Snapchat. Q: What is #nezonwheels and how did it start? Peter: I have a weekly Snapchat show called #nezonwheels that really takes off from my lectures and the content I talk about in my classes, most of it relates to life strategies, mindsets, healthier ways of looking at yourself and the world around you. I use all kinds of inspirational stories and anecdotes from around the world and throughout history and relate them to our modern lifestyle and how we can adopt these mindsets ourselves. I use a lot of humour, pathos, and try to be as loose as possible including my audience in the process and I am just having a killer time doing it. Q: When did you realise the potential of Snapchat and when did you get serious about it? Peter: Snapchat came on my radar around 2014 but I didn’t actually start snapping until late 2015 so I am pretty brand new in the game but I am so addicted it’s crazy. And I love the fact that Snapchat, now called Snap Inc., is growing exponentially. I am super excited to see the upcoming changes and evolution of the platform. Q: What do you think about the future of Snapchat as a marketing tool? Peter: I think the future of marketing for Snapchat is unlimited, and is only going to get more exposure, and as the platform evolves, so will the reach and discoverability. 150 million users a day is nothing to scoff at, and people my age (I’m 39) tend to have this misperception that Snapchat is still just for kids, and they are dead wrong. Snapchat is a viable marketing tool and I know a lot of people who are leveraging it for their businesses as am I.
I have about 7 micro-narrative books published and look to leverage all my platforms for my author business, and Snapchat is one of my favorite. Q: What advice would you give to someone who is just starting to grow their Snapchat audience? Peter: My advice to anyone starting on Snap would be to do it, and do it often, and not to worry so much about creating these great stories just yet, but to really not be afraid of posting small snippets here and there just to get comfortable with the dynamics, and more importantly getting comfortable with getting in front of the camera. Be creative, don’t be afraid to experiment, and follow other snappers to see how they do it, and literally go do it! Don’t over think it at all. Q: Who is your favourite person to follow on Snapchat? Peter: If I had to pick one snapper that I like to follow I would say that Tristan Tales has great, fun, exciting stories to watch and he is somebody that I think new snappers could learn a lot from. It’s a beautiful platform for engagement and getting your story across. And that’s the key, learning to tell your story in a compelling, visual way is, in my humble opinion, going to be the most sought after skill in 2020 and beyond, if not already. Q: Awesome thanks for talking with us Peter, where can we connect with you online? Peter: Thanks Jason! 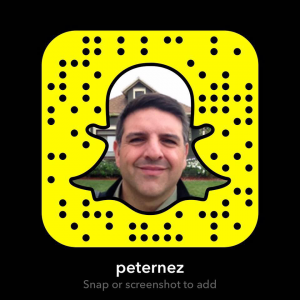 You can add me on Snapchat at @peternez and Facebook @peternezauthor. You can also find my books on Amazon by clicking this link. Thank you Peter for taking the time to share your knowledge and opinions. To connect with Peter, scan the snapcode at the top of this article. If you enjoyed this interview, please check out more in the Snapchat Influencer series.